Debt-laden publisher Johnston Press has put itself up for sale. Headquartered in Edinburgh, Johnston Press is one of the largest local and regional multimedia organisations in the UK and operates a £60m printing facility on the site of the former Dinnington Colliery in Rotherham. Over-hanging the company is a "Bond" - a £220m 8.625% senior secured notes, which become due for repayment on 1 June 2019. A strategic review of financing options was first announced in March 2017. In an update to the stock exchange, Johnston Press said: "Pursuant to this strategic review and in order to assess all strategic options to maximise value to its stakeholders, the Board of Johnston Press announces today that it has decided to seek offers for the Company." 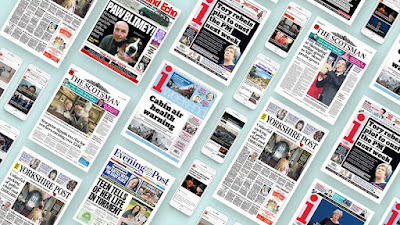 As the publisher of titles including the Yorkshire Post and Sheffield Star, the company has previously said that the trading environment was "challenging, notwithstanding early signs of some improvement in the national print advertising market." In June, bosses confirmed that it was in discussions regarding a Regulated Apportionment Arrangement (RAA) with the pension trustees and pensions regulator. Used when an employer has a pension scheme in deficit, faces insolvency, or requires restructuring, an RAA would allow Johnston Press to continue trading, while the Pension Protection Fund (PPF) takes on the pension scheme. David King, CEO of Johnston Press said in August: "There are two sets of issues affecting Johnston Press. The first is the Group's historical debts, including its pension obligations, which continue to weigh on our balance sheet. The second is the tough market conditions affecting the performance of our newspapers and websites." For the 26 to June 30 2018, Johnston Press posted a statutory operating profit of £7.4m compared to £4.9m in the same period last year. The state-of-the-art facility on the site of the former Dinnington colliery includes one of the most modern and fastest presses in the world. It has the capacity to print 192 pages in full colour, 120,000 newspapers an hour in full colour and 75 titles per week.